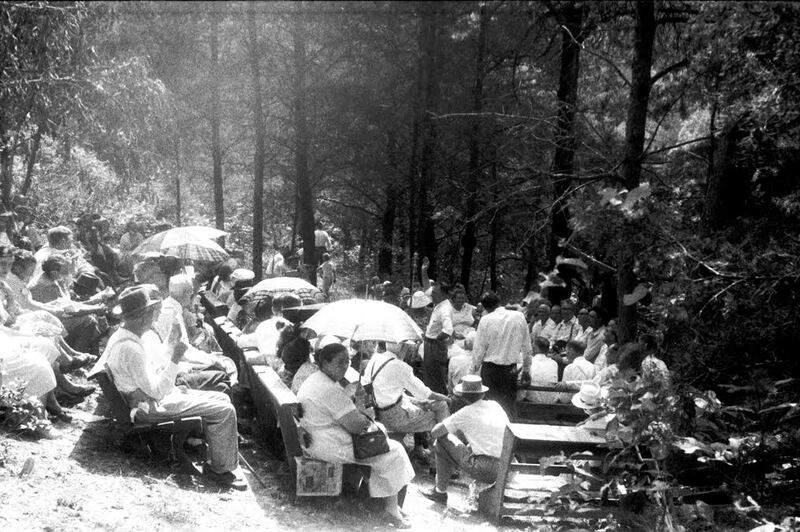 ​Photo credit: Old Regular Baptist meeting in Blackey, KY 1959. Courtesy of the Alan Lomax Archive. Over the course of fifty years, from 1933 to 1983, pioneering folklorist Alan Lomax collected some 60 hours of recordings in or relating to the Commonwealth of Kentucky—ballads, lyrics, banjo breakdowns, fiddle tunes, religious material, children’s games, topical songs, and oral history. In 2015, Lomax’s centennial year, the Alan Lomax Archive of the Association for Cultural Equity and the American Folklife Center at the Library of Congress are collaborating with a variety of Kentucky institutions to return the Lomax collections to the people of the Commonwealth. Appalshop is a core partner in this repatriation initiative and is excited to host the Lomax material in its Archive, where it will be contextualized in an extensive multimedia collection documenting a variety of Appalachian artists and tradition bearers. With support from the National Endowment for the Arts, Appalshop will also be conducting a series of public programming and activities across the region that celebrate both the material that Alan Lomax collected and the communities and traditions he documented. These events will include performances of Lomax material by contemporary artists, collecting of stories from descendants and neighbors of people Lomax recorded, and public forums with noted scholars and folklorists. The Alan Lomax Kentucky Repatriation Initiative kicks off this year on June 5th and 6th with Appalshop’s 29th Annual Seedtime on the Cumberland Festival, which will feature a round-robin performance by young Kentucky musicians interpreting songs from across the five decades of Lomax’s Kentucky recordings, as well as archival media screenings from the Alan Lomax Collection at the American Folklife Center and the Appalshop Archive. This tour of programming will continue across Appalachia, as Appalshop is partnering with a number of regional institutions including Mars Hill University and Ferrum College to feature performances, screenings, contemporary collecting and educational outreach within those communities. Stay tuned to www.appalshop.org for more details about those events in the coming months. Sam Gleaves is a folk-singer and songwriter from Wytheville, Virginia. Sam earned a degree in Folklore from Berea College and preserves mountain culture in performance and documentary media. Sam’s debut album of original songs “Ain’t We Brothers” will be released in summer 2015. Kevin Howard, from Letcher County, Kentucky, is a singer, banjo player, and guitarist. His repertoire is comprised of old-time music, hymns, and the banjo ballads of his native eastern Kentucky. Kevin has been featured in numerous publications and currently serves as a banjo teacher for the Passing The Pick and Bow after-school program produced by Appalshop’s Traditional Music program. Kevin’s debut album is being released later this year on Appalshop’s very own June Appal Records. Bonnie ‘Prince’ Billy makes music out of Louisville, Kentucky, and has done so for a number of years. The most recent Bonnie record is “Singer’s Grave A Sea of Tongues” on Drag City records. Will Oldham, who reps for Bonnie, has been a guest DJ on WMMT. Karly Dawn Milner, from Rowan County, Kentucky, sings, writes and plays guitar and banjo with her band KarlyDawn & The HillFolk. She also plays and sings with the Clack Mountain String Band and the KarlyDawn & Little Sarie Band, and has appeared at Merlefest, the Berea Celebration of Traditional Music, Seedtime on the Cumberland, the Carter Family Fold, the Old Town School of Folk Music in Chicago, and on Kentucky’s Red Barn Radio. She has worked in Traditional Music Outreach to school children through the Kentucky Folk Art Center since 2010 and has spent many summers as faculty for the Cowan Creek Mountain Music School. Raised by a coal miner and teacher in Van Lear, Kentucky, Brett Ratliff grew up with a love for the mountains, their people, and their culture. As a youngster, Brett starting singing in church and sang along to recordings of Loretta Lynn and Hank Williams. As a teenager he began playing guitar for bluegrass bands. But when Brett met musical father and son Jamie and Jesse Wells he became hooked on the moving, emotionally charged mountain music of his home. Since then, Brett has learned banjo tunes and ballads from some of the masters of old time music, including knock-down banjo player George Gibson of Knott County and Pike County fiddle and banjo player Paul David Smith. Nathan Salsburg is a Grammy-nominated producer, archivist, writer, and guitarist, and Curator of the Alan Lomax Archive. He is currently facilitating the Archive’s Kentucky repatriation initiative, which is depositing digital copies of Lomax’s recordings, made between 1933 and 1983, to repositories across the Commonwealth. He lives in Louisville.